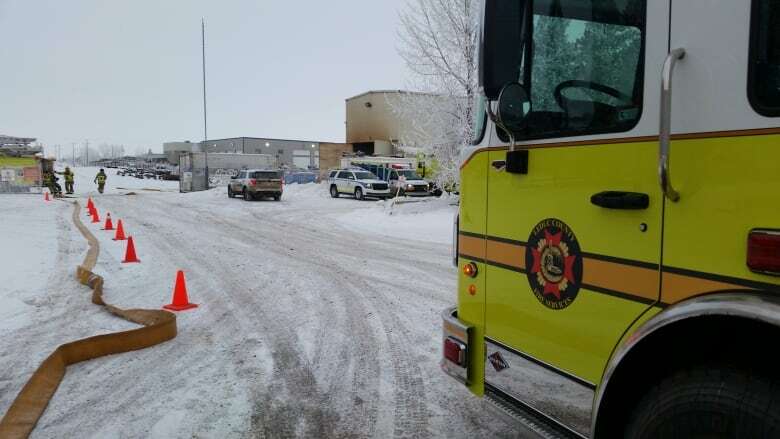 A man in his 40s was killed and two other men were seriously injured in an explosion inside a welding shop in an industrial area south of Edmonton Thursday morning. The blast occurred in Nisku around 8:15 a.m. MT inside Ja-Co Welding at 1304 8th St. in the Nisku Business Park. One man was found dead on scene, RCMP said. A middle-aged man was transported to hospital in Edmonton in critical, life-threatening condition, Alberta Health Services said in a statement. Another middle-aged man was transported to hospital in stable condition, AHS said. RCMP previously reported that only two men were injured on scene. Police were not releasing the name of the deceased. 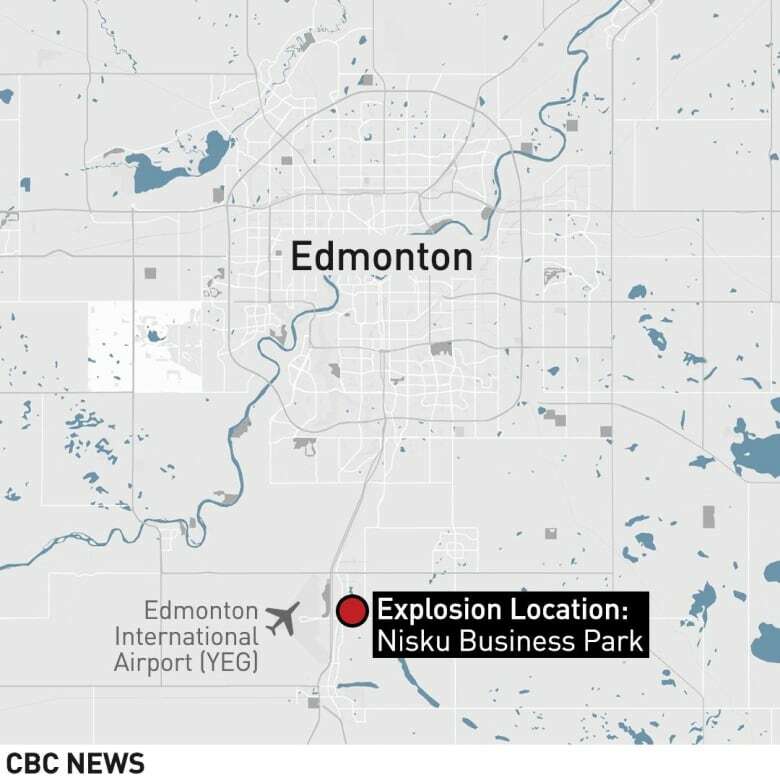 "Leduc RCMP were called to a business in Nisku, [to] reports of an explosion on site there," RCMP Const. Mike Hibbs told CBC News. "Upon arrival, they discovered a small fire." Police said there was no concern for public safety, but members of the public were being asked to stay away from the area. RCMP, firefighters, paramedics and investigators with Occupational Health and Safety remained on scene, police said in a news release around 10 a.m.
Leduc County fire Chief Keven Lefebvre said his crews were at the Nisku fire station about 2.5 kilometres away when they felt and heard the force of the blast. "We were in the office talking about our daily duties, what was lying ahead for the day, and we felt a big thump in the area, shortly followed by a dispatch to this business," Lefebvre said. "We felt it and heard it in our building so it was a pretty significant explosion. Some of my volunteer on-call responders come from Beaumont and they said they felt it in Beaumont. "It was a pretty good blast, you could hear it for miles." When firefighters arrived on scene the building had already been evacuated. After a primary search, a decision was made to allow burning acetylene tanks to vent off, Lefebvre said. "Once they burn off their contents there is less risk of explosion … so that's what we've been doing for the last little while. "Those tanks are burning down now. The fire is basically out." As of 11 a.m., the acetylene tanks had burned off almost all of their fuel and firefighters were preparing to turn the scene over to RCMP and OHS. The cause of the explosion is under investigation, Lefebvre said. Crews will remain on scene as required, he said. "The initial blast caused some pretty extensive damage so there won't be anybody else going in here for a while until some engineers check the stability," he said. Nisku is a hamlet and an industrial park within Leduc County, about 25 kilometres south of downtown Edmonton. According to the company website, Ja‐Co Welding is a 110,000 square-foot facility divided into fabrication shops, offices and a machine shop.